What is the prophesied image of the beast? I have long suspected that it is the Earth itself! After men walked on the moon in 1969 the New Agers were saying they now had "their image." It was an image of "the Whole Earth." As we approach the time that prophesied events seem apparent and New Agers are becoming emboldened in their a la Shirley Maclaine "Karmageddon" prognostications against us. I have been reporting, inter alia, on these "deep ecology" "eco-spirituality" developments since 1981. The Harry Potter movies were a form of mass initiation for impressionable children. AVATAR is obviously a form of mass initiation in "New World Religion" concepts for both adults and children. "According to Bron Taylor, author of the new book Dark Green Religion, nature-based spirituality is not only undergoing a renaissance – it’s giving religious institutions a run for their money. "Western society is in a dramatic shift away from monotheism, notes Dr. Taylor, professor of religion at the University of Florida. And in many cases, he says, former believers are turning to Mother Earth to fill the spiritual void. "The trend is obvious on the West Coast. Only 22 per cent of British Columbians attend a religious institution once a month or more, according to a 2008 poll by sociologist Reginald Bibby, compared with 38 per cent in Ontario. "Instead, spiritual seekers are forming de facto congregations in nature’s cathedrals – mountain valleys and old-growth forests. "In eco-spirituality workshops that she leads outside her counselling practice, Ms. Pieroni encourages people to think of the Earth as a sentient being, she says, “and to contemplate that the Earth that they’re walking on is also conscious of them.” . . . Similarly, in the movie Avatar, the blue-skinned Na’vi people worship a biological force that unifies their planet and all its life forms. The force is so tangible that the Na’vi can literally plug into it by connecting the tips of their long tails to the fronds of sacred trees. . . . On Pandora, the Na’vi people form circles to channel their world’s unifying power, notes Maureen Jack-LaCroix, an eco-spiritual facilitator and event producer known for her work on New Music West Festival and Tears Are Not Enough/LiveAid. And in Vancouver, hundreds of people gather once a week in 40 community circles organized by Be the Change Earth Alliance, which Ms. Jack-LaCroix launched in 2008. 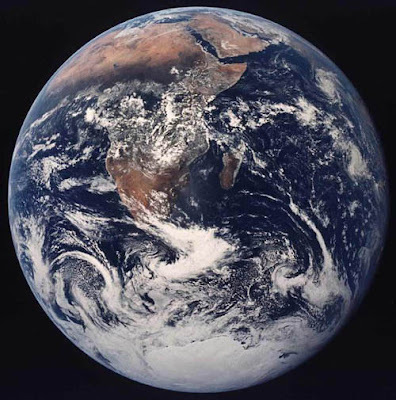 While the groups are open to people of all faiths, the goal is to restore a sense of connection with Earth’s life-support systems and to commit to actions that support sustainability, Ms. Jack-LaCroix explains. “The essence of spirituality is feeling connected and not alone,” she says. JD and Susanna have been working diligently with the help of other talented researchers from this forum to document disturbing about to be implemented developments in human RIFD and/or microchip implantation and tracking. The material is real. It is also happening. My next several internet radio programs and these blog columns will cover it. I also plan to submit material to NEWSWITHVIEWS for its use. 6 And I saw another angel flying through the midst of heaven, having the eternal gospel, to preach unto them that sit upon the earth, and over every nation, and tribe, and tongue, and people: 7 Saying with a loud voice: Fear the Lord, and give him honour, because the hour of his judgment is come; and adore ye him, that made heaven and earth, the sea, and the fountains of waters. 8 And another angel followed, saying: That great Babylon is fallen, is fallen; which made all nations to drink of the wine of the wrath of her fornication. 9 And the third angel followed them, saying with a loud voice: If any man shall adore the beast and his image, and receive his character in his forehead, or in his hand; 10 He also shall drink of the wine of the wrath of God, which is mingled with pure wine in the cup of his wrath, and shall be tormented with fire and brimstone in the sight of the holy angels, and in the sight of the Lamb. 11 And the smoke of their torments shall ascend up for ever and ever: neither have they rest day nor night, who have adored the beast, and his image, and whoever receiveth the character of his name. 12 Here is the patience of the saints, who keep the commandments of God, and the faith of Jesus. And I saw another angel fly in the midst of heaven, having the everlasting gospel to preach unto them that dwell on the earth, and to every nation, and kindred, and tongue, and people, 7 Saying with a loud voice, Fear God, and give glory to him; for the hour of his judgment is come: and worship him that made heaven, and earth, and the sea, and the fountains of waters. 8 And there followed another angel, saying, Babylon is fallen, is fallen, that great city, because she made all nations drink of the wine of the wrath of her fornication. 9 And the third angel followed them, saying with a loud voice, If any man worship the beast and his image, and receive his mark in his forehead, or in his hand, 10 The same shall drink of the wine of the wrath of God, which is poured out without mixture into the cup of his indignation; and he shall be tormented with fire and brimstone in the presence of the holy angels, and in the presence of the Lamb: 11 And the smoke of their torment ascendeth up for ever and ever: and they have no rest day nor night, who worship the beast and his image, and whosoever receiveth the mark of his name. 12 Here is the patience of the saints: here are they that keep the commandments of God, and the faith of Jesus. The Scriptural warnings also tell us that those who cross the forbidden line break out with hideous sores all over their body. They would long for death, but death would not come. Already, those implanted with "Digital Angel" / Verichip implants -- human and animal have suffered painful cancers. The implications are clear. Giving into this system carries no advantage -- neither here nor in the world to come! Jesus warning was that this system of deception would come "like a snare" upon all those that dwell in the face of the Earth. (Luke 21:35) May the Lord count us worthy to escape this deception. Expect to be marginalized. Expect to have your willingness to accept such tracking and implantation as an indicator of sanity and parental fitness. Develop thick skin and stay strong. It appears to now be, absent divine staying, at hand. "J.D." WILL JOIN ME ON MY INTERNET RADIO PROGRAM TONIGHT -- WILL UPDATE US ON LATEST DEVELOPMENTS ON VERICHIP HUMAN TRACKING! Our regular forum participant J.D. has amassed tremendous document on what appears remarkably close to development and financing of a massive human control tracking system. Players include Tommy Thompson, George Soros, Stephen Rockefeller, and others. We will be discussing this on the air tonight and very soon, J.D. 's columns will appear here as guest columns for this blogspot. Please join us this afternoon (West Coast) and this night (East Coast) at http://www.themicroeffect.com. Please plan to join us both in the chatroom and by listening live. We encourage call ins at 888-747-1968. 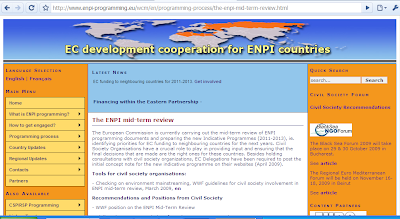 UPDATES: Pay attention through all of this to the mid-term review process for the European Neighbourhood Initiative Process due to take place in 2010 for remain years through 2013 of ENP process. 1. Battle religious fundamentalism, world-wide. 2. Favorable trading terms for the participants leading to a Mediterranean Free Trade Zone by 2010. 3. Get the USA out of the Mediterranean and/or greatly reduce its presence there. My educated guess is that Javier Solana is still a major, if not the primary player in this scheme. A very young man, 39 year old Ahmad Massadeh, a Jordanian ambassador has been named the first Secretary General. Javier Solana's "business school" appointment is conveniently in Barcelona, the castled headquarter of the Mediterranean Union. The New Agers were hot on their hopeful "emergence" back in 1981 when I discovered the New Age Movement and would have been so since 1975. Somebody who was only 4 in 1975 obviously would not have been the object of their then messianic expections. Somebody who was 33 might well have been. A palace was assigned for the operation in Barcelona, Spain. Suddenly, this week, a well trained, young, ambitious Jordanian ambassador, Ahmad Massaadeh, has been named its first chief. This should be interesting to watch, particularly as Spain and Javier Solana's alter ego, Cristina Gallach, run the six month European Union Presidency -- the first under the Lisbon Treaty launch the first post-Lisbon Spanish Presidency. Catherine Ashton, the Socialist non-hereditary English Baroness is coming under criticism. I'm posting incoming news on this at my Twitter account. 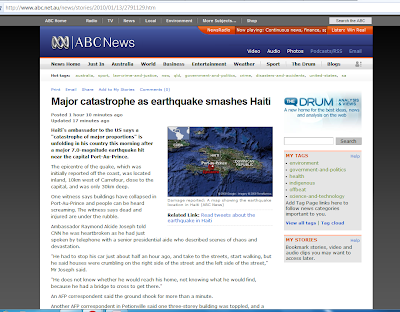 "There shall be earthquakes in divers[e] places . . ." This was a significant one! I know immediate relief is needed and you should send contributions to trusted relief agencies. 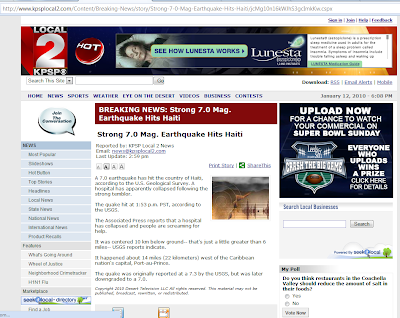 Reportedly, an important hospital collapsed. One more reason, literally, to jolt us out of complacency. Pun intended. 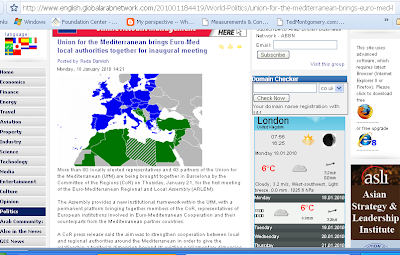 Barcelona Process - Club Med - New Developments - Twittered? State of the Union - Barcelona Process TWITTERED? The Barcelona Process is alive and well. 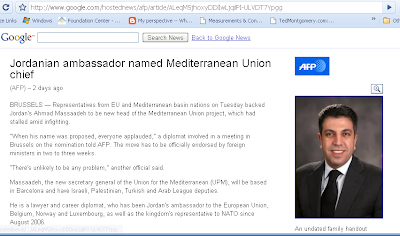 It was recently announced that a Jordanian has been chosen to head its current incarnation: "Club Med" a/k/a "Union of the Mediterranean." Ahmed Masade is his name. One internet development I have up to now resisted has been "twittering." 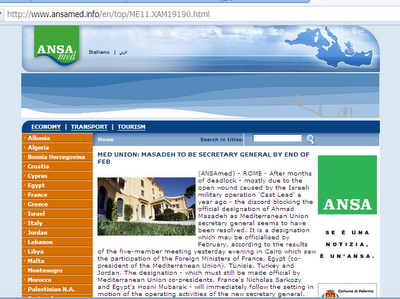 That may now change after learning tonight that EU_Med is using "Twitter" as its favored communication device. So, I will probably reluctantly use Twitter for more communications as well. I would appreciate all the expert advice you can give me here as to how to eliminate garbage from the twitter page and columns. I evidently opened a page long ago and then did not use it. Evidently others did and have posted distasteful links. A few friends also posted there. I suspect some of my enemies visited as well! The picture there? Oh, I have identical twin cousins, Jimmy and Johnny Butler. They were born one month to the day after me. I was the first grandchild born on both sides of the family. Less than three years later there were seven on my dad's side and five on my mom's. I decided to take a fun picture from one of my computers equipped with mirror images to create "Kimmy and Connie Butler." My family is still chuckling about the spoof. So, I will reluctantly utilize TWITTER more while keeping my serious work here on my blogspot. Feel free to use both. I once read somewhere I can't currently recall that when Ethiopian emperor Haile Selassie, was met by crowds worshipping him as God (something our nemesis "Squeakbox" still does) he cried and asked them to cease and desist -- he was NOT God! 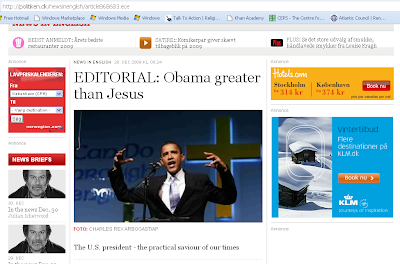 Barack Obama has told the world he is a Christian. It will be a good test of his sincerity to see how fast and emphastically he denounces this blasphemous abomination. My thanks to blog forum participant Deb for bringing this to our attention in the comments section.